It was pretty fun creating our menu, but I have to admit I keep putting off pricing our menu. It’s intimidating giving things a quantifiable value and not knowing how customers will respond to it. Is there a right or wrong? People put so much emphasis on price and profit in business that no one wants to under or overvalue themselves. Well, I finally went through all the research I collected on pricing a menu for our coffee shop and started working through it. Here are some things to consider to start going about this if you’re having a slow start like I was. 1. Market prices. Look at your market and competitor’s prices to see what your area charges for coffee -or similar- products, and what your area is generally willing to spend on them. Find a range your customers will expect, then determine if you want to be on the high or low side based on your positioning and company value. 2. Menu costs. Calculate your costs to know how much each menu item costs to make. Some simply factor in their cost of goods sold, and others directly consider overhead costs in their prices as well. 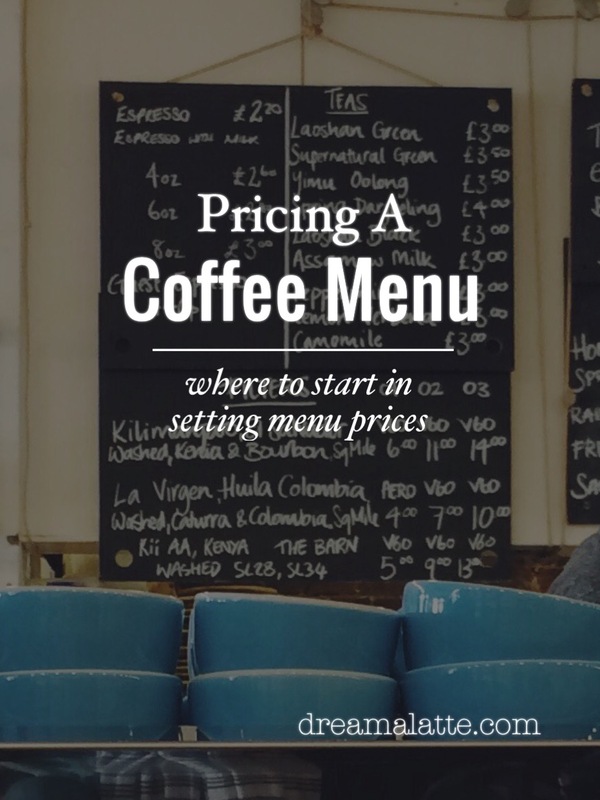 Cost Plus Pricing– Start with finding the costs to make each menu item, line by line. I made a spreadsheet that broke down each menu item by ingredient and supply costs, and per size. Then calculate a target price range based on your desired margin. Average coffee bars spend 20-30% for ingredient costs, meaning their earnings are 70-80%. Divide your food costs by your price point, and you can see this food cost percentage– being your earnings. You might not be able to get your desired margin per each/all items, and will have to make up for this in your bottom line. Overhead fixed costs (Gross Profit Model)- If you calculate your cost of goods sold, and you have a 80% profit margin on your drinks, realize this is not pure profit. This needs to also pay rent, utilities, and your other overhead costs. Calculate how else this profit margin is distributed so you know how much is pure profit, after all expenses are paid. This is easier done on an average margin, not per item line. Breaking down the menu and working on prices. 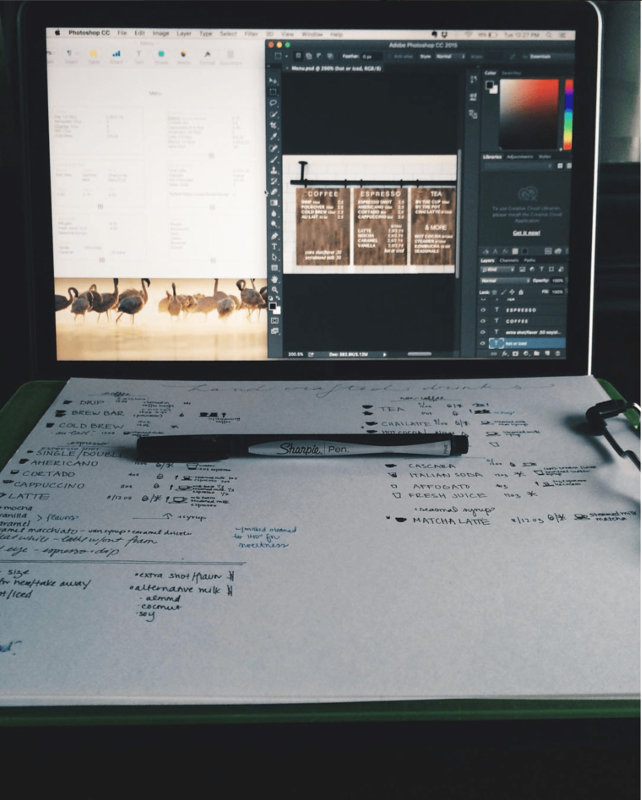 I love coffee and organization! Price according to perceived customer value and don’t sell yourself short. Customer perception plays a big role, and many times a low price will be perceived as low quality. Customers will often pay more for a better product they think they deserve, but price too high and you’ll scare people away. The fine line is where all these variables meet, which is why it’s important to know your market. You can’t compete on low prices, and you don’t want to go out of business, so you should constantly show customers what they’re paying for and why they wouldn’t want to go anywhere else. You might charge less if you can get a lower cost of goods sold, however in the speciality foods industry, you shouldn’t compete on price. 4. The bottom line. Think of other ways to increase how much customers spend at each sale, like diversifying your products or services, or focusing on various marketing and promotions. Price items line by line, but then consider the menu as a whole as well. You may want to vary prices to have something for all your customers, or make up for low-margin items when balanced with other high-margin, high-demand or high-volume items. 5. Adjustments. You can choose to stick with your prices for good, but you may more likely have to adjust prices a few times a year. Determine this based on experience, customer response and the market. If market prices increase, prices would have to as well, and small adjustments regularly would be more preferable than abrupt jumps. You can always support price increases by reminding your customers of your competitive advantages that set you apart in the first place. I hope your shop is irresistible to your customers! It goes to say that deciding prices also has a lot to do with your market and positioning. Know your brand and your target market, use your business instinct and observations, and be willing to adapt and think ahead. If you have any helpful resources or insight, please share below! –Gilbert, S., Martin, W. E., & Formichelli, L. (2005). The Complete Idiot’s Guide to Starting And Running A Coffeebar. New York, NY: Penguin Group. –Fox Business: Want to Open a Coffee Shop? –Monaghan, J., & Huffaker, J. S. (1995). Espresso! : Starting and running your own specialty coffee business. New York: Wiley. –Shopkeep: How much should I charge for a cup of coffee? –Yukai-Chou: How much should you price your menu items?